What I have found to be very effective in beaver trapping with Comstock Cage Traps is basically covering an entire opening, no wiggle room. To begin with, when using castor lure to attract a beaver I try to find a location that either is narrow or can be narrowed to the width of the cage so that there can be no easy way for a beaver to swim to one side or the other. 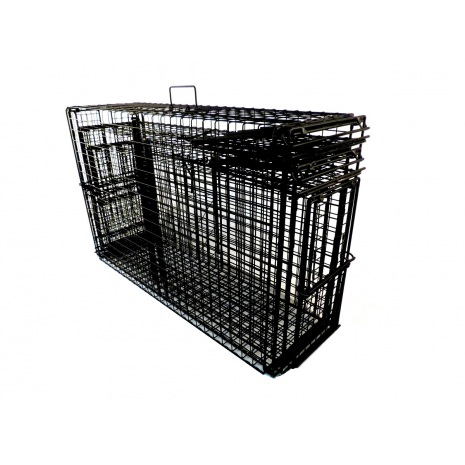 If the run is very wide cages can be set side by side a few inches apart, either two or three abreast. Second, I like to set the trap in water that is just a bit deeper than the height of the trap, about 13 inches or so. At this point the trap or traps cover the entire opening, no going around or over. Covered in this manner, it is unlikely you will have anything but a catch when beaver come in to check out the castor smell. 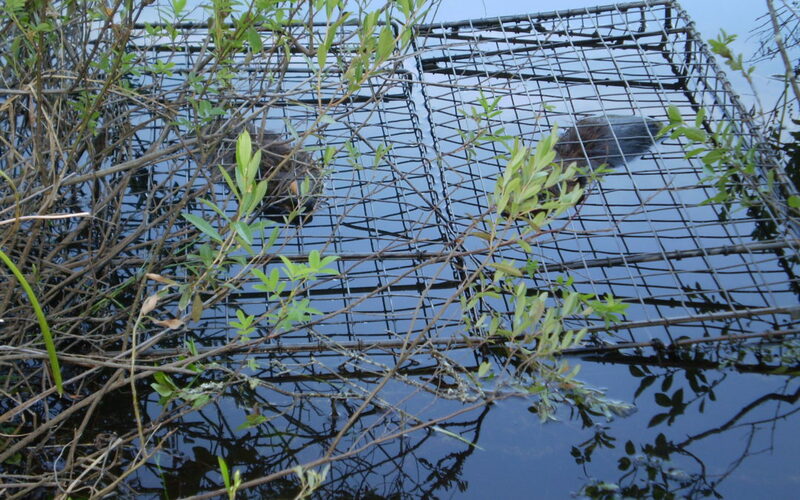 At times a beaver will go around everything, both traps and narrowing material, completely skirting the trap, but on the return trip back to the pond after checking out the castor, will slip into the cage to be captured. When trapping channels without lures the same logic can be applied. 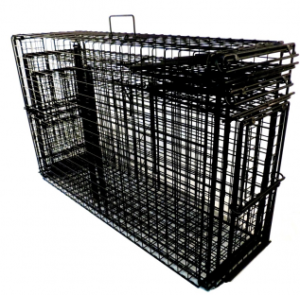 The other day I had a situation where I had placed two cages on the bottom in a stream run that was just about the width of the traps but perhaps 20 to 22 inches deep. I did take one beaver on the first check, but knew more were present. At any rate, when I reset, this time I decided to stack the traps, one on top of the other. What this did was cover the entire run side to side and top to bottom. Beaver are often on the bottom but just as often on top. With both the width and depth of the water being all but perfect, the bottom trap would be submerged while the top trap was in 8 to 10 inches of water. Both traps were set upside down covering the entire run, leaving an air space in the top trap. There was plenty of water in the top trap for the beaver to swim in, but space at the top. This time both of the traps connected, a small yearling beaver was on the bottom with the adult on top. When the top trap was placed above the first it didn’t seem really solid, but even after the catch was made I found that the trap stayed put, in place. Of course a couple of small diameter sticks could be pushed down through the wires to hold both traps securely. I haven’t stacked traps many times but I know others who have. The first time I tried it I actually caught a muskrat on top and an otter on the bottom. When I did it I had air spaces at the top so the top animals are alive. I see no reason why the traps couldn’t be placed in 24-25 inches of water with the top of the trap resting just under water. I once had a really mucky channel to set that all but swallowed the bottom cage when I dropped it in. About eight inches of muck bled into the trap, leaving a small four inch opening, which was way too tight for a swimming beaver to enter. In really mucky runs beaver are more frequently on top. Since there was about a foot of water above the cage in the muck, I set another cage on top, using the bottom cage as a base, covering the run quite nicely with the top trap just under water. The next trip produced the blanket beaver I had been looking for.